This tutorial will be useful for the Samsung Galaxy W users if you want to flash the firmware in your device with ODIN. Please make a note that flashing will cause a violation of the guarantee policy of Samsung. There is a chance of your device may bricked. So, use the given below procedure at your own risk. We (Best android blog) would not be held responsible/liable for anything. 1. First download any one of the firmwares which you want to update. If you already have a firmware, you can download the Ancora. OPS and the Odin Multi Downloader v4.43.exe from other. 2. While Switched off, keep the following buttons pressed. 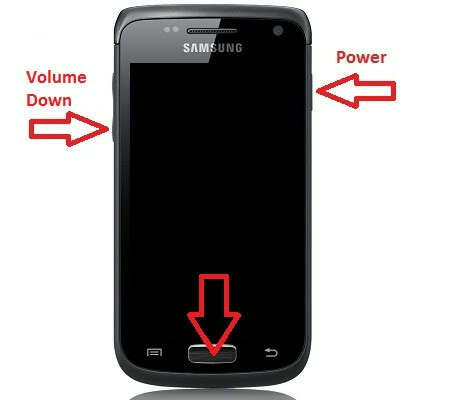 Release the power button once the Samsung Galaxy is switched on. 3. As soon as the screen with the exclamation mark appears hit the Volume up-button. Now you should be in the download mode. Connect your device to the Computer. NOTE : In order that your Samsung Galaxy W to be detected by ODIN, you will have to install the drivers manually or install Kies (Kies can be uninstalled right after, if prefered, because the drivers will remain in the system). Make sure Kies is not running in the task-manager, while using ODIN. 4. Open Odin Multi Downloader v4.43.exe. 5. Click on the OPS-Button and select the Ancora.ops file. 7. Click on the One Package Button and select the downlaoded MD5-file. 8. Click on the start-button. Flashing takes around 10-15 minutes. and the first start up takes up to 5 min., so please don’t panic and don’t press anything until the home screen appears!